The New York Times bestseller that's changing America's diet is now perfect for younger readers What's for dinner? seemed like a simple question--until journalist and supermarket detective Michael Pollan delved behind the scenes. From fast food and big organic to small farms and old-fashioned hunting and gathering, this young readers' adaptation of Pollan's famous food-chain exploration encourages kids to consider the personal and global health implications of their food choices. 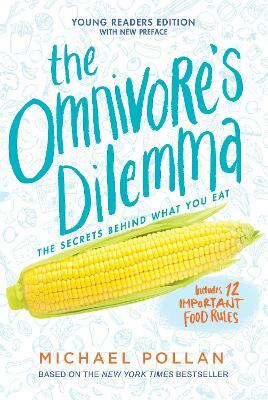 In a smart, compelling format with updated facts, plenty of photos, graphs, and visuals, as well as a new afterword and backmatter, The Omnivore's Dilemma serves up a bold message to the generation that needs it most: It's time to take charge of our national eating habits--and it starts with you. Michael Pollan is the author of five books- Second Nature, A Place of My Own, The Botany of Desire, which received the Borders Original Voices Award for the best nonfiction work of 2001 and was recognized as a best book of the year by the American Booksellers Association and Amazon, and the national bestellers, The Omnivore's Dilemma, and In Defense of Food.A longtime contributing writer to The New York Times Magazine, Pollan is also the Knight Professor of Journalism at UC Berkeley. His writing on food and agriculture has won numerous awards, including the Reuters/World Conservation Union Global Award in Environmental Journalism, the James Beard Award, and the Genesis Award from the American Humane Association.